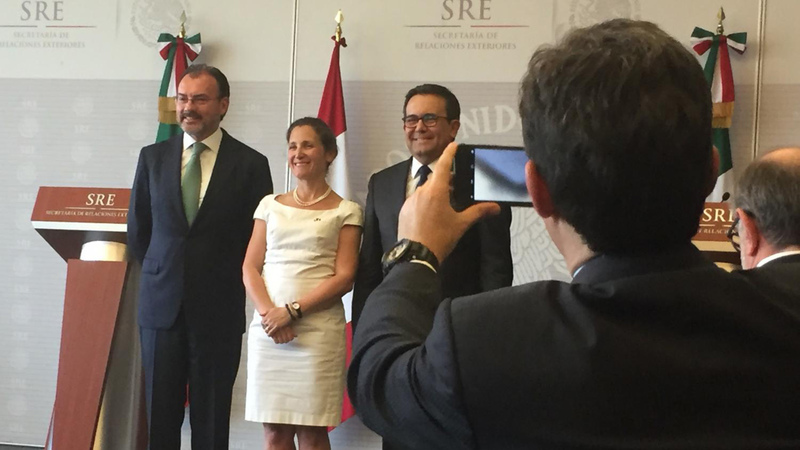 / Modified may 25, 2017 9:07 a.m.
Luis Videgaray, the Mexican secretary of foreign affairs; Chrystia Freeland, Canada's minister of foreign affairs; and Ildefonso Guajardo, Mexico's secretary of economy, met in Mexico City to discuss NAFTA and other issues. MEXICO CITY — Last week, the top U.S. trade official formally notified Congress of the intention to renegotiate the North American Free Trade Agreement. What the American government will do is still unclear, but Mexican and Canadian authorities say they’re ready. In early May, Commerce Secretary Wilbur Ross said the U.S. will either revise NAFTA as a three-way trade agreement or dissolve it to pursue separate deals with Canada and Mexico. But Mexican and Canadian officials met in Mexico City on Tuesday and made their stance clear: NAFTA will be revised, yes, but only if the three nations involved work together. “This is a trilateral agreement, and therefore for us, it is simply a matter of common sense. The negotiations on NAFTA will be trilateral,” said Chrystia Freeland, the Canadian minister of foreign affairs, at a press conference at the Mexican office of the Secretary of Foreign Affairs. According to the U.S. Department of Commerce, NAFTA is currently the world's largest free trade area, linking approximately 450 million people. Mexico is Arizona’s top destination for exports and Canada is No. 2.